Super elegant White and Black Floral Maxi Dress with Criss Cross Back! Perfect for any special occasion! It features a classic white and black color combo with floral print and criss cross back. 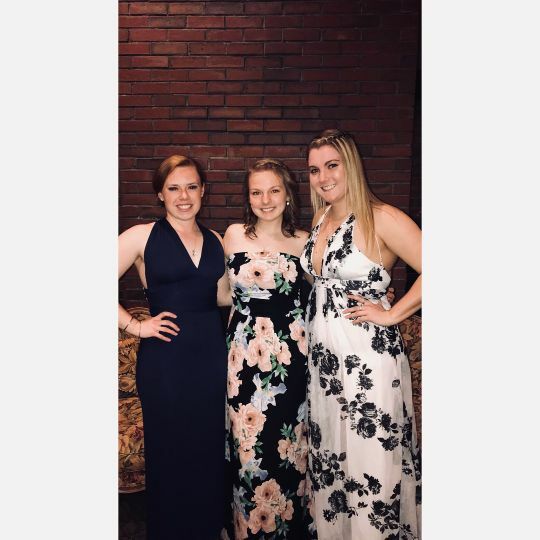 Loved this dress, it was perfect for the ball I attended with my roommates! It was a little long to dance in, but I made it work by safety pinning it in the back! I bought this dress as my wedding dress! It came quickly and got true to size which was perfect. No alterations were needed and it is BEAUTIFUL. It’s pretty “showy” in the front for a bigger chest but still looks gorgeous with the flow and open back. Stunning dress with beautiful detail. Perfect for my engagement pictures! My favorite part is I’m 5’9 and this dress touches the floor! Being tall I have a hard time finding long maxi dresses! I ordered a small and it fits perfect! Love this dress!! So flattering on! The quality is excellent! Had to go up a size because of the band at the waist, it runs small, I usually wear a small, had to go to a medium. Fits perfect at that size. Best part is my husband loves this on me!